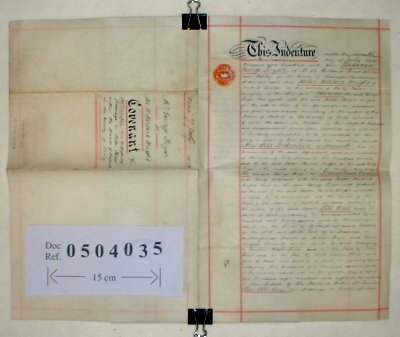 Parchment : 2 documents - Both consisting of 2 sheets 40cm x 25cm with revenue stamps. George Poyser is selling copyhold property in the Manor of Matlock to Walter Wright for £1200. There are actually 2 documents being sold together here. The first, headed "Covenant" is a contract for the sale in which George Poyser undertakes to complete the formalities required by the Manor of Matlock - ie. to surrender the property to the Lord of the Manor. The second is headed "Surrender and Admittance" and is the record of the Manor Court in which George Poyser surreners the property to the Lord of the Manor, after which Walter Wright is admitted to it. The property is a plot of 720 sq.yds bounded on hte East by Dale Road and on the West by Holt Lane. It contains two dwelling houses erected by John Nuttall known as Lyndhurst and Glenholme. The photograph shown is that of the Deed of Covenant.